I attended tonight’s pre-submission meeting at Kahler Hall of Harper’s Choice. The room was packed ( probably 50 people). People from Real Estate Company were Bill O, Steve, Jim, Rob. People from the engineering firm were Chris, Mike. I could not write down all the last names. Steve, the owner of Clarksville Square Shopping Center and other shopping centers addressed residents concerns. The communication tonight were candid and straightforward. 1.The development will be handled by River Hill Square LLC. The current Garden Center Owner is still part of the redevelopment. 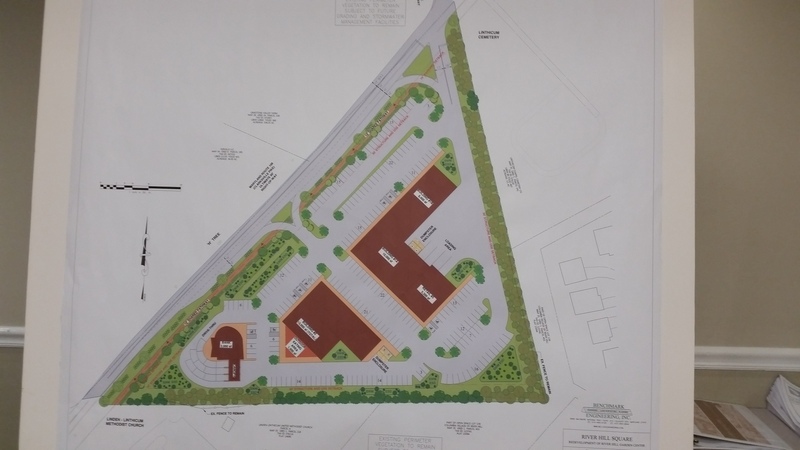 There will be a bank, a restaurant ( not fast food), a retail/ market( different from Clarksville Square Shopping Center), some office building and a new USPS. Everything is premature and under consideration only. They need submit environment plan and site development plan within one year after tonight’s meeting. They do not need to go before the Planning board since there will be no waiver, no variation etc for this plan as old development plans. People are really concerned about traffic. However, the proposed plan tried to reduce traffic by developing a three-lane solution (one left lane to the Sheppard Lane, one middle lane through, one right lane to the center) and expanding traffic light at Sheppard Lane. Please see the above figure at top right corner. There is also a new pathway planned. Updated: The parking has increased from 100 to 140 to today’s 244. Many attendants were complaining the county had not been taking care of our residents’ need by improving Clarksville Pike or Route 108. At the end, I suggested they should change the name to “River Hill Triangle” and move the building a little closer to Route 108, which leaves wider buffer to the houses at the back.